SHARJAH, 17 November, 2018: Sheikh Khalid bin Abdullah bin Sultan Al Qasimi Chairman of Department of Seaports & Customs inaugurated ‘Crossroads: Cultural Exchange between Islamic Civilization, Europe and Beyond' in Sharjah Museum of Islamic Civilization, with the presence of H.E. Manal Ataya, Director-General of Sharjah Museums Authority, Prof. Christina Haak, Deputy Director General of State Museums of Berlin, Prof. Stefan Weber, Director of Museum of Islamic Art in Berlin. 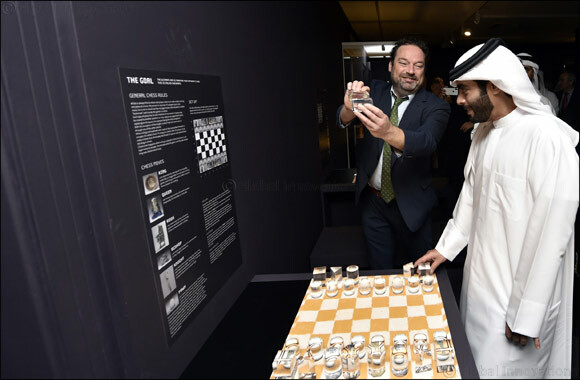 The exhibition is the result of a collaboration between Sharjah Museums Authority and the Museum of Islamic Art in Berlin and celebrates the 10-year anniversary of the Sharjah Museum of Islamic Civilization. Running until April 27th, 2019, the far-ranging collection on display explores how societies develop as the result of encounters and exchanges, either through trade, migrations or conquests, and how the constant flow of people, objects and ideas has shaped the world from medieval times up to the present day. The exhibition has been carefully curated into two main sections. The first, ‘People on the Move: Transfer of Knowledge and Skills', focuses on cities and regions within the Islamic World, Europe and Asia and their impact on socio-cultural encounters. The first of four sub-sections, ‘Technology and Sciences' explains the development and trade in lusterware pottery from Malaga in Spain to Kashan in Iran and artistic metalwork from Mosul in Iraq and Venice in Italy, between the 10th and the 14th centuries. ‘Trade and Commerce' explores the importance of the Ottoman trading hubs of Aleppo, Cairo and Istanbul. The three cities can be described as markets of the world due to their long and illustrious fame as lively commercial posts harbouring mixed socio-cultural and religious populations. ‘Politics and War' looks at the impact of the Crusades in the Mediterranean region. It also addresses the Mongol invasion of Iran and its resultant regional impact. Finally, ‘Power and Beauty' demonstrates the importance of Isfahan in Iran and Agra in India as highly influential centers of power and learning. The exhibit's second section, ‘Objects on the Move' (or the World in your Living Room) tells the story of how a variety of ‘foreign' objects are now commonplace in the daily routines and social landscapes of cultures all over the world. These include Oriental carpets, chess and chess pieces, and a wide selection of pottery styles and ceramics. A series of multi-media stations located throughout the exhibition will guide visitors through the different sections and offer insights and explanations for the artefacts on display. The Museum of Islamic Art in Berlin, home to one of the largest collection of Islamic works in Europe, has contributed 54 objects of historical and cultural importance to the exhibit. These are co-curated with another 10 objects from the collections of Sharjah Museums Authority to provide a unique opportunity for visitors to reflect on questions about globalization and the travel of objects and people between 200 to 1,000 years ago, and its relevance for us today. “Societies flourish and grow through the constant movement of people that contribute to the fabric of their community and bring prosperity by virtue of the diversity in ideas, culture, beliefs, knowledge and so forth.